Why can't people find my web site when they search on Google? How can I get my website to show up nearer the top of the search results – without paying somebody loads of money to set it up? The answer to both of these questions is: READ THIS SEO BOOK! You don't need to be a programmer or a web site design whizz. You don't need to spend hours and hours researching search engine optimisation. And you don't need to pay somebody megabucks to do it for you! Anybody with a basic knowledge of how to create web pages can achieve amazing results, quickly, by following the simple five-step method described in this book! Over the past few years, search engine optimisation has developed into something of a science as webmasters and small business owners try to figure out how to trick the main internet search engines such as Google, Yahoo, and MSN into listing THEIR sites near the top of the search results list. These people have spent HOURS researching and experimenting to determine how to get the best results, and a number of big, pricey books have been written on the subject. But it really is not that complicated! We've boiled it down to FIVE SIMPLE STEPS that just about anybody can follow. It's so simple that this book is fewer than 50 pages long! You won't get bogged down with boring, technical descriptions and geek-speak; this book is written in easy-to-read plain English, with clear descriptions of technical terms where they are absolutely necessary. "Who is this book for?" Then this seo book is for you! "But I'm not a web site designer!" You don't need to be. You just need to be able to create simple web pages, and this can be done using any number of website design programs priced from free upwards. You can start with one of the templates that probably came with your design program, and simply modify the text and, if appropriate, pictures. "I don't have a big budget for internet marketing!" No problem. This book costs far less than most other books on the subject of SEO – it's only $9.95 for the ebook edition and $12.95 for the paperback (£9.95 in the UK). "I can't wait for the book to arrive! I want to get started right away!" As well as a paperback edition, the book is available in ebook format at a price of just $9.95. You can download it directly to your computer immediately after placing your order. "What about SEO firms that guarantee top position placements? Do you offer a guarantee like that?" Any professional SEO company can get top placements for your web site if you are willing to pay for sponsored links (ads, in other words). This can easily cost you hundreds of dollars (or pounds, or euros, or whatever) every month. My simple five-step method won't cost you anything other than the price of the book. It's the ONLY solution for people on a budget. "How do I know your simple method works?" That's the kind of result you want, isn't it? The catbase.com web site was optimized using the FIVE SIMPLE STEPS described in this book! "... the tips are written for real people. Practically any person, even those with limited computer skills, will learn ways that he or she can improve their search engine ranking. Most of the ideas only take a few minutes to accomplish creating returns that will continue the life of the website." 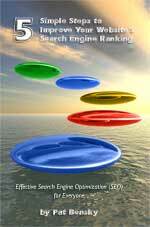 "Very highly recommended, especially for those new to the internet and website promotion, 'Five Simple Steps To Improve Your Website's Search Engine Ranking' is a slender, 41-page, 'user friendly', do-it-yourself instruction manual [that] will enable anyone to advance their website in any search engine." "...quick and easy advice on quick and easy ways to make a website more easily found by any search engine user to find a particular website ... Very highly recommended, especially for those new to the internet and website promotion." "A terrific resource for us that are not very computer savvy." Quick! don't waste any more time! Order your copy now! "Who are you, and what are your credentials?" My name is Pat Bensky. I'm a business owner and author. I don't claim to be an SEO expert; what I DO claim is that I've been using the internet since the very earliest days and have been running websites for my businesses since about 1992. I've spent many hours researching search engine optimization and experimenting with ideas on my web sites, and have boiled it all down to the five simple, effective steps that I describe in this book. You'll find the book enjoyable to read and very informative. A Lizard in The Sun – this is an autobiographical account of three years that I spent travelling around the world when I was in my twenties. "What's the difference between 'i.e.' and 'e.g.'?" "Should there be an apostrophe in the word 'its'?" "Is it 'ensure' or 'insure'?" "Is it 'complimentary' or 'complementary' - and why could this be a costly mistake for my business?" Don't have time to optimise your web site yourself?